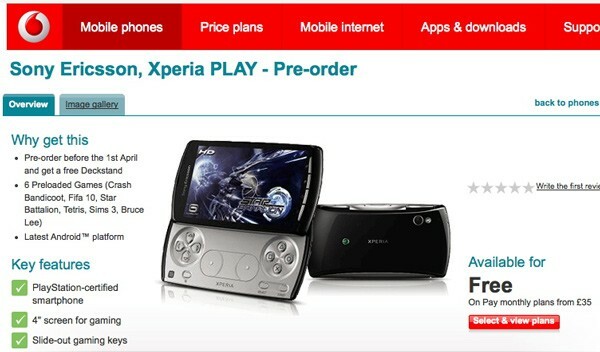 Sony Ericsson's next great thing, the Xperia Play, has just appeared on Vodafone UK's pages as its newest pre-order treat. Scheduled for a March 31st launch with a price tag of £free if you're willing to pony up £35 or more a month on a two-year contract. Vodafone's Xperia Play will ship with six preloaded games including Crash Bandicoot, Fifa 10, Star Battalion, Tetris, Sims 3, and Bruce Lee on the included 8GB memory card -- and includes some unnamed "desk stand" if pre-ordered before April 1st. We're kinda curious if any of you out there are going to jump on this newest Android 2.3 toy, so feel free to let us know what you think in the comments below.